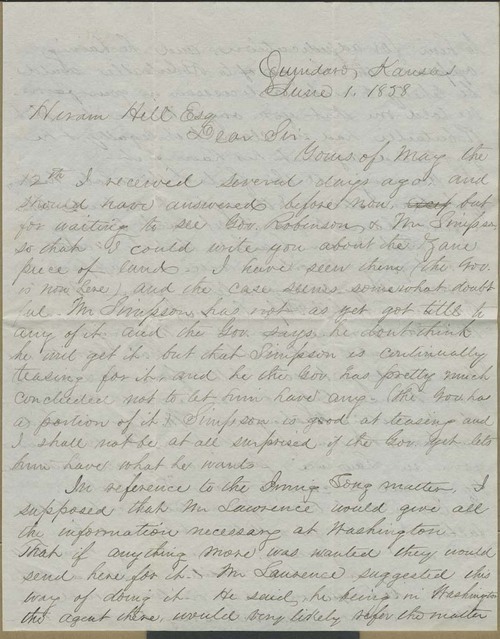 Charles Chawick wrote from Quindaro, Kansas Territory, to Hiram Hill in Massachusetts, to tell him that it appeared favorable that Hill would win possession of the land disputed by Robert Robetaille, a Wyandot Indian. However, Chadwick feared that the decision may not be made as easily as he had earlier anticipated, since Robert Lawrence had been seen in Leavenworth and had not traveled to Washington to work with Nathaniel Causin. Nonetheless, Abelard Guthrie had given up trying to obtain the land as well, leaving Hiram as the only other claimant.